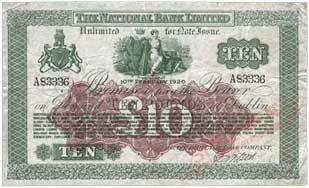 The section on National Bank of Ireland notes Series C 1918-1920, and National Bank Series D 1921-1927 (Irish Free State era) has been completely revised, with the addition of new introductory pages, and new images covering every known Type (by signature) and denomination (£1, £5, £10). Also added is a date gallery, National Bank of Ireland date listing 1918-1920, and National Bank of Ireland date listing 1921-1927 with an image of a banknote of each date of issue for all the issued notes. Several dates of some denominations remain to be pictured. There are also prefix gaps in the Series D £1 notes where the date is not known. A great addition to the web site. These notes are among my favorites in the Irish series. The dates of some denominations which remain to be pictured are detailed following. £1: Image sought of £1 note with prefixes J (date 1 Oct 1919). 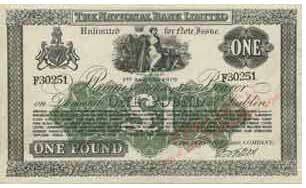 £1: Images sought of £1 notes with prefixes D (date 1 Nov 1921), E, H, J (Dates unknown). 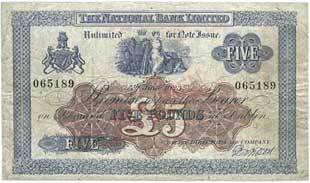 £5: Image sought of £5 notes dated 5 Nov 1926. £10: Image sought of £10 note dated 10 Feb 1922.